If your family loves living large, they’ll love The Edgewood! Functional, affordable, spacious and thoughtfully designed – you couldn’t ask for more. 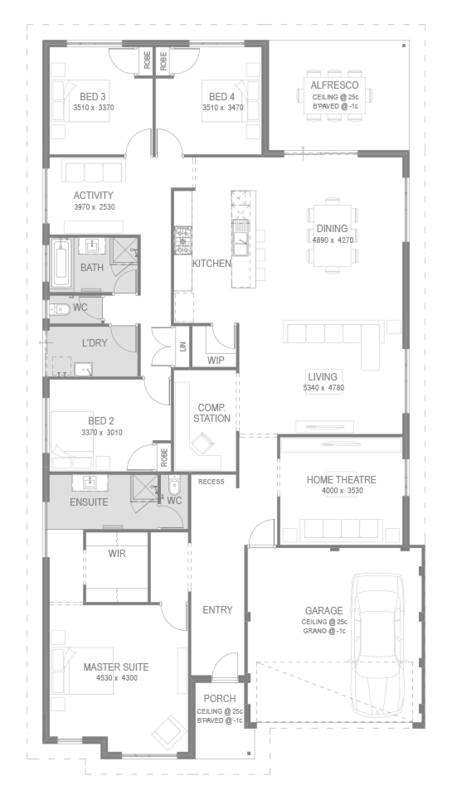 With a total floorplan of over 278sqm, there’s room for every member of the family to spread out and feel at home. The Edgewood offers a huge master suite at the front of the home, with a big his-and-hers walk-in robe and ensuite. A second bedroom is ideally located for a guest or teen, while the kids can do their own thing at the rear of the home, where two bedrooms open off an activity room for fun and games. Central to the communal space is the big kitchen with a walk-in pantry and an island bench that integrates seamlessly with the living, dining and alfresco area. Add a theatre, a computer station and a double garage with shopper’s door, and your perfect family home is complete!